DENVER--(BUSINESS WIRE)--In one of the most significant advancements of unmanned aircraft under development by a U.S. utility, Xcel Energy is operating drones beyond visual line of sight during ongoing inspections of transmission lines near Denver. Xcel Energy joins local, state and federal officials today in celebrating the milestone flights and watching the drone as it inspects electric power lines near Ft. St. Vrain Generating Station in Platteville, Colorado. Using advanced command-and-control technology, licensed pilots are remotely operating a small, 35-pound drone. Equipped with two cameras, the drone is collecting data on the condition of power lines and transmission towers with flights along a 50-mile route. “Leading the development of unmanned aircraft builds on our longstanding commitment to safety for our workers, the public and the environment. This is especially important in Colorado where inspecting power lines in the mountains and remote locations is challenging work,” said David Eves, executive vice president, group president-utilities, Xcel Energy. The Federal Aviation Administration (FAA), in an unprecedented decision for the utility industry, granted Xcel Energy special permission to conduct the beyond-visual-line-of-sight flights under a waiver, announced earlier this year. The waiver allows the company to commercially operate a drone without visual observers or a chase aircraft. The authority to fly a drone remotely greatly enhances the efficiency and cost-effectiveness of using the technology. For several years, Xcel Energy has collaborated with the FAA and has contributed to the development of operational and safety requirements for unmanned aircraft operations in the utility industry. Last year, the company entered into a Partnership for Safety Program (PSP) with the FAA to operate drones for power line inspections within visual sight of operators. When the transmission inspections are completed near the Denver area, Xcel Energy and its partners will work with the FAA to extend these operations in other states where the company provides electric service. The company surveys more than 320,000 miles of electricity and natural gas infrastructure to ensure the safety and reliability of its energy system. 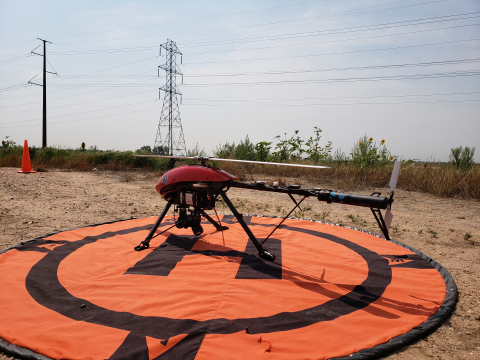 Xcel Energy is currently working with several industry leaders including Harris Corporation, Northern Plains UAS Test Site, Phoenix Air UNMANNED, LLC and Altus Intelligence. Xcel Energy (NASDAQ: XEL) provides the energy that powers millions of homes and businesses across eight Western and Midwestern states. Headquartered in Minneapolis, the company is an industry leader in responsibly reducing carbon emissions and producing and delivering clean energy solutions from a variety of renewable sources at competitive prices. For more information, visit xcelenergy.com or follow us on Twitter and Facebook. Xcel Energy is the first U.S. utility to operate drones beyond visual line of sight during ongoing inspections of transmission lines.